Key messages and advice for anyone thinking of undertaking a riparian restoration project are included in three short videos. Contact us if you are in Canterbury and would like a copy provided on a CD or USB stick. Hear the story of the fantastic restoration work carried out over the last 15 years from the people involved. 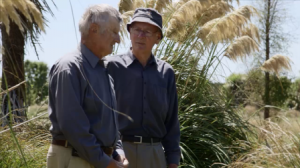 Peter Chamberlain and Colin Patterson farm on the banks of Harts Creek and talk about the work that has been carried out. 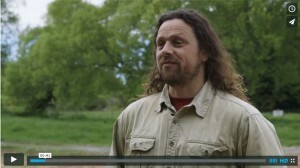 Thanks to WWF and Environment Canterbury for their help in making this video. Planning for planting – view the video here. This short video covers some of the things to consider before you get started on your planting project. Thanks to Selwyn District Council and Environment Canterbury for their help in making this video, and SFF and CEF for funding assistance. 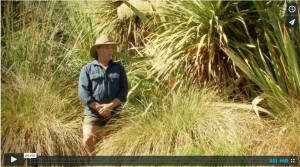 Planting native plants – view the video here. This very practical video covers site preparation, planting and installing plant protection, and the maintenance required in the first few years. Planning is a vital part of any project and considering a few key points and getting advice about the best plants and how to plant them can save you time and money, and help to ensure your project succeeds. We’ve brought lots of information together in our new booklet “A guide to managing your drains”. You can download a copy here. We’re keen to get any feedback or comments so we can improve later versions of the booklet. What have you found most useful, have we missed anything? Both councils have information about managing drains and about recommended plants. Information from ECan’s Living Streams Programme includes choosing the right plants. Environment Canterbury offer biodiversity funding through their Immediate Steps program. SDC has produced a planting guide and also has a simple form to be completed before undertaking planting on a classified drain. SDC have a Natural Environment Fund to encourage and assist landowners with voluntary work that benefits the natural environment and to support the continued identification and protection of on-farm biodiversity. Landcare Research has a website – Nature Services – which can help with plant selection and includes many useful links. 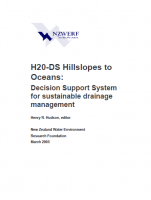 In 2005 NZWERF, the New Zealand Water Environment Research Foundation, published a decision support system for sustainable drainage management called H2O: Hillslopes to Ocean edited by Dr Henry R Hudson. Much of this information is very relevant for the Selwyn Waihora catchment. A shorter Field Guide is also available. Videos – we’re working on a series of short videos, with the first one completed in mid-2013 and the second in early 2014. Our plan is to add to this series over the next year or two. We’re keen to look at the wide range of values that can be associated with a well managed drain and to tell some stories of successful community projects. Summer student – in 2012/13 we had a Lincoln student looking at the wide range of costs and benefits associated with drain restoration. This research contributed to our Guide to Managing Drains booklet. Restoration plans – between July 2011 and June 2013 we were able to provide riparian restoration plans free of charge to 20 landowners in the Selwyn-Waihora catchment. Halswell bus trip – In December 2012, in conjunction with Whakaora Te Waihora, we hosted over 60 people for a bus trip of the upper Halswell Catchment. We heard from engineers, restoration experts and local farmers and saw some great examples of drains being managed for multiple values. Demonstration Site leaflet – WET and the Sustainable Drain Management team have put together a simple guide to some of the more recently planted riparian restoration sites around the catchment. The guide features 12 sites planted between 2008 and 2011, plus suggestions of a few more established sites that can be visited. Celebrating Success – in June 2012, together with the Harts Creek Streamcare Group, the SDM team hosted a field trip to celebrate the restoration work carried out over the last 10 years on Harts Creek and Birdlings Brook. It was great to hear from the farmers about what had inspired them to to plant with natives. Despite the damp weather we were able to see first-hand what can be achieved and to hear about the difference it has made to the water quality and local biodiversity. Colin Patterson also shared his poetry with the group. We finished with lunch and a chance for everyone to ask questions and gather information. A focus for WET is the Sustainable Drain Management Project, which brings together a team from WET, Environment Canterbury, Selwyn District Council, Ngai Tahu, Lincoln University, and the local community to develop a shared understanding of the drainage network – the current management practices, the scale and nature of issues associated with drains, and potential solutions. One focus is developing and delivering consistent messages and advice across the catchment. Maintaining or enhancing the drainage function. Improving water quality – with a focus on phosphate/sediment transfer rather than nitrates. Some of the water entering the drainage network from groundwater is quite high in nitrates, but denitrification requires suitable residence time with an appropriate energy source. This is more likely to occur in a wetland situation rather than with flowing water in drains. Therefore we’ll be focusing more on management to reduce the phosphate/sediment loads. Improving in-stream health and biodiversity, particularly by providing increased shading to reduce water temperature, and improving terrestrial biodiversity with appropriate indigenous species planted along drains and waterways. Improved aesthetics is also an important outcome which is particularly important for some. Many people really like the look of native planting and it demonstrates concern for the environment to the wider community. Some studies suggest it can even increase property values! Field days, presentations, displays and information sheets are providing relevant information for our catchment and we have worked with a small group of farmers to provide riparian restoration plans for their properties. These address site specific issues such as fencing and planting low spots and gullies to provide a buffer to trap surface water runoff and sediment, and will contribute towards developing plan templates to enable more efficient planning in the future. Demonstration sites have been installed in various locations. These show the successful restoration system developed over recent years, enabling planting to be installed in a cost effective and efficient way and with very high survival rates. Thanks to everyone who is contributing time and energy to this project, and to our funders – the Ministry for the Environment’s Community Environment Fund, the Ministry of Agriculture’s Sustainable Farming Fund, and Canterbury Community Trust. Thanks also to ECan and SDC for funding in addition to their in-kind contributions.